What is a positive deviant? - Page 3: A positive deviant is an outlier / an exception, whose outcome deviates in a positive way from the norm - even when working with the same resources as everyone else. What are examples of what positive deviants do? - Page xiii: Positive deviants in healthcare install electronic healthcare records, provide easier phone and e-mail access, offer expanded hours, involve more nurses to make sure that patients don't miss mamograms and cancer follow up. - Page 59: Rather than focusing on the 97% of women, who are circumcised in Egypt, look and learn from the 3% who are not. What enabled them to avoid circumcision? - Page 83: When Dr Ignaz Semmelweis discovered in 1847 in Vienna that fatal infections were spread among patients by doctors who failed to wash their hands between examinations, he immediately instituted a procedure requiring physicians to wash their hands between patient visits and change into clean lab coats before examining patients. As a result, hospital mortality rates from infectious diseases declined dramatically. - Page 146: Transparency and peer review were important during the positive deviance process at Goldman Sachs. What can a person do to strengthen positive deviance in a community? - Page 10 and 116: Put focus on what is going right / on what works - instead of putting focus on what is wrong. - Page 47: Let people own their choice to be involved. - Page 74: Share stories of positive deviance. - Pages 38, 45 and 110: One of the most powerful reinforcers of behavioural change is evidence / proof that a newly acquired practice results in measurable improvement over the previous status. To reinforce behavioural change, measure results. It is easier to act your way into a new way of thinking than to think your way into a new way of acting. - Page 125: Allow leadership to be exercised from everywhere. - Page 193: Learn from the people, plan with the people, begin with what they have, build on what they have. - Page 194: Start a positive deviance process with an authentic invitation, in which community members can opt in or out. - Page 197: Involve everyone. - Page 197: Go to improbable places and to unlikely people to find solutions. - Page 199: Ask open questions such as what, how, why? - Page 204: Connect people who have not connected before. - Page 205: Share success stories. 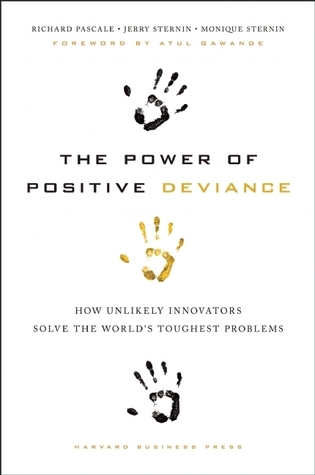 Sign into Goodreads to see if any of your friends have read The Power of Positive Deviance. Does the book mention a great deviant, Ignaz Semmelweis, a Hungarian physician whose work demonstrated that hand-washing could drastically reduce the number of women dying after childbirth. He was ridiculed by the medical establishment of his day, suffered a nervous breakdown, was committed to a mental institution, and died at age 47. Semmelweis's practice earned widespread acceptance only years after his death, when Pasteur confirmed the germ theory and Lister, acting on Pasteur's research, practiced and operated, using hygienic methods, with great success. Hi Paul, thanks for your input. Yes, on page 84, I read that because Semmelweis instituted a procedure requiring physicians to wash their hands between patient visits and change into clean lab coats before examining patients, mortality rates from infectious diseases declined dramatically. A few years ago, Ekkehard Kuppel reminded me of this quote by Mahatma Gandhi: First they ignore you, then they laugh at you, then they fight you, then you win. My question to you: Why are some changes, which are meaningful, sometimes so hard to make happen? Can you please share personal experiences explaining what we need to do better to make meaningful happen faster? Thanks in advance. as did as bars and restaurants with lots of smoking customers. It took decades to ban lead from paint and gasoline. The lead industry fought health regs and delayed them longer than it took in Europe. Thank you for the examples, Paul. Change can happen quickly when the opposition eventually gets discredited, as happened with Big Tobacco.